The M6 has been closed from Rugby J1 to A14 Catthorpe due to a serious crash. Photo by Debbie Bolton. Two people were injured in a serious crash on the M6 this morning. 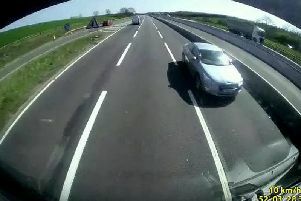 The collision involving a lorry and a car happened on the southbound carriageway at junction 1. The lorry driver, a man in his twenties, had a serious leg injury and was taken to University Hospital Coventry and Warwickshire. The man driving the car was checked over and discharged at the scene. West Midlands Ambulance Service was called shortly after 9.15am to assist. The team sent a paramedic area support officer in a rapid response vehicle and an ambulance crew. East Midlands ambulance service and the Warwickshire and Northamptonshire Air Ambulance also attended. Traffic is building around J1 Rugby and the A426 as drivers attempt to exit the motorway. Warwickshire Police is advising motorists to find an alternative route.